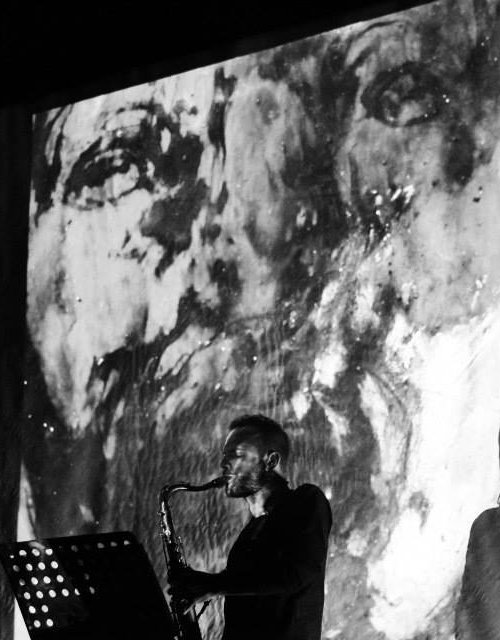 is an italian composer, improviser and saxophonist born in Naples the 22/03/1988. He’s an expert on creative writing alternatives to the pentagram, he loves the relationships between music and other arts and does not like to be labeled in a specific genre. Since 2013 he has been involved in free-form activities, concerts and artistic performances for 500 gigs all over Europe in festivals, contemporary art museums and clubs. He played with: Chris, Corsano, Adam Rudolph, Elio Martusciello, Alvin Curran, Colin Vallon, Ossatura, Carl Hubsh, Ensamble Dissonanzen, Lisa Mezzacappa, Fabrizio Elvetico, Caterina Palazzi, David Ryan, Nandy Cabrera, Decibel Ensemble. In the electro-acoustic orchestra of Naples he was directed by: Adam Rudolph, Alvin Curran, Lisa Mezzacappa, Carl Hubsh and Elio Martusciello. He collaborates with the physicist and poet Bruno Galluccio with his compositions on Galluccio's book "La misura dello zero" (Einaudi ed.). He has collaborated with Martin Errichiello, Luisa Terminiello, Kanaka Project and Teknari for their videos or working with visual art. He collaborated with UAB, university of Barcellona, for the music of the movie “Cabeza de Orquidea“. "Asylum" is his third personal album and is produced by Clean Feed Records. Previous works "Stories of a vain diary" and "Turn Up!" have been published in collaboration with manyfeunder\homemadelabel. He is an italian composer, improviser e saxophonist. Born in Naples 22/03/1988. He is an expert on creative writing alternatives to the pentagram, he loves the relationships between music and other arts and does not like to be labeled in a specific genre. Since 2013 he has been involved in free-form activities, concerts and artistic performances for 500 gigs all over Europe in a festival, contemporary art museum and club. In the electro-acoustic orchestra he was directed by: Adam Rudolph, Alvin Curran, Lisa Mezzacappa, Carl Hubsh and Elio Martusciello. He has collaborated with Martin Errichiello, Luisa Terminiello, Kanaka Project and Teknari for his videos or work with visual art. He collaborated with UAB, university of Barcellona, for the music of the movie “Cabeza de Orquidea“. "Asylum" is his third personal album and is produced by Clean Feed Records. Previous work "Stories of a vain diary" and "Turn Up! ", published in collaboration with manyfeunder\homemadelabel.